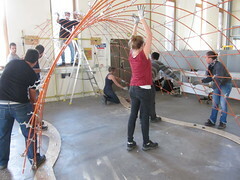 Since 2010, the workshop ‘Building Freeform’ confronts engineering and architecture students to the complexity of building doubly-curved structures. 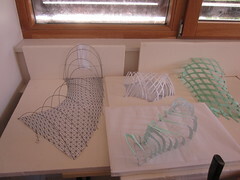 From the first drawings to the completion of a full scale pavilion, three groups propose an answer to the same program, but with a different structural typology: elastic gridshell, rigid gridshell and tensile structure. 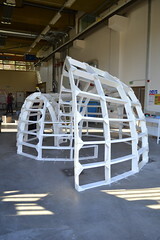 Doubly curved structures fascinate architects and engineers and seem to be within easy reach thanks to contemporary digital fabrication tools. 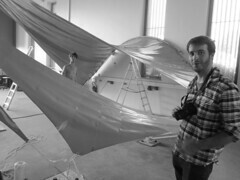 However, they remain enigmatic and hard to comprehend by the designers. 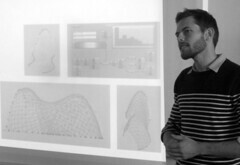 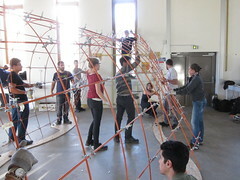 The objective of this one-week workshop is to explore the possibilities offered by doubly curved structures, both from a technological and conceptual perspective. 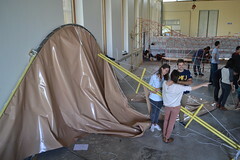 The major part of the week is devoted to the design and fabrication of three full scale pavilions, with three different typologies: an elastic gridshell, a rigid gridshell and a tensile structure. 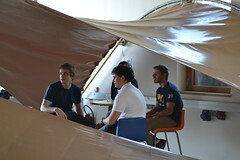 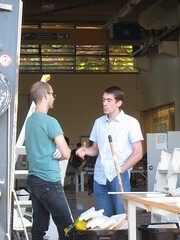 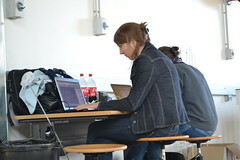 The workshop combines hence fabrication and computation, with the use of scripts and routines developed for Rhinoceros and Grasshopper in the Navier Lab. 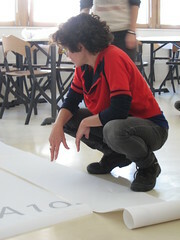 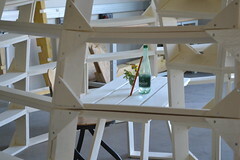 Like previous years, the workshop took place on the facility slab of the department. 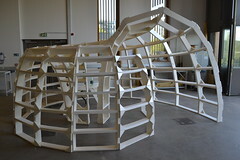 The space was divided into three equivalent zones, so that each pavilion can benefit from a dozen of anchorages on the ground and of a couple anchorages on the side wall which were abondantly used for once. 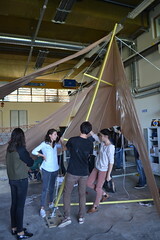 And so were used the various elements (arches and posts) available for the tensile structure, which as usual was provided by Serge Ferrari Textile. 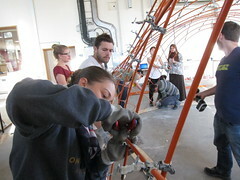 The orange composites rods of the elastic gridshell were sponsored and supplied by Solutions Composites. 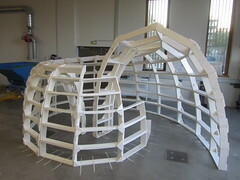 The material used for the rigid gridshell was standard polystyrene boards and screw, hopping that next year, the arrival of robot will make it possible to make it out of wood. 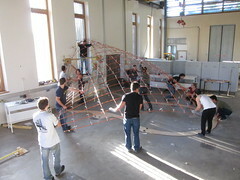 Concerning design issues, the form of the tensile structure was defined with FerrariSketch which is free and offers the possibility to define a different stress ratio in the two directions of the membrane. 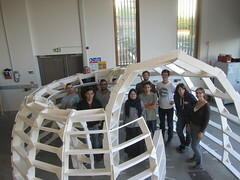 For the elastic gridshell, students benefit from the taylor made tools developped in the Navier laboratory (meshing, form-finding and analysis), although their usage was this year quite approximative leading to an approximate control of the final form. 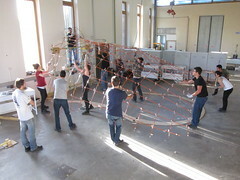 For the rigid gridshell, the strategy to design a grid with torsion free nodes was changed: last year, the form was defined on the basis of inversions of revolution surfaces, while this year it relyed on generalised canal surfaces which can be define as the combination a a canal surface and a combescure transform. 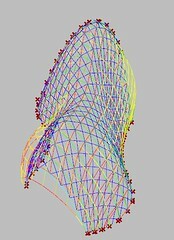 Hence, the geometry results from a parametric extrusion of a profile curve along a guide curve. 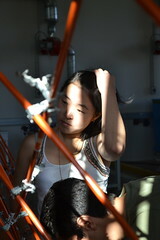 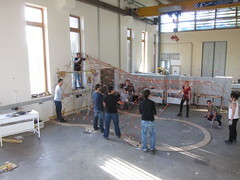 To ensure the feasibility of this last structure, a prototype was built during the summer. 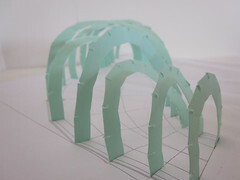 Then, during the week, three or four proposals were studied for each typology on Tuesday (see models below). 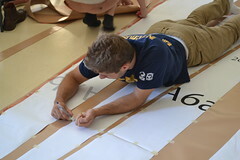 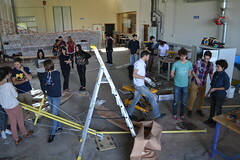 A competition was then organised on Wednesday morning to select the three objects that will be built at a larger scale during the second part of the week. 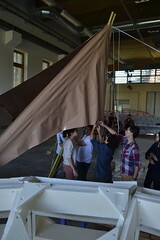 For each type of pavilion, the jury is composed of the teaching staff and of all the students who have been working on another structural type, each with one vote. 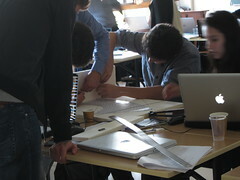 The selection is made democratically on relevance, feasibility and originality criteria. 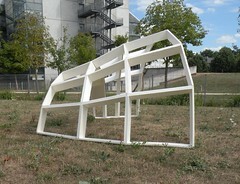 The laureate were this year called: extension voilée, le bi-coque de Jormungand and Peanut. 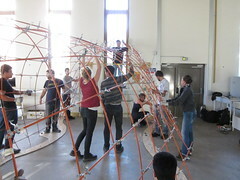 A prototype of rigid gridshell with torsion free nodes has just been built to validate the global design method and to evaluate the feasibility of the whole construction process. 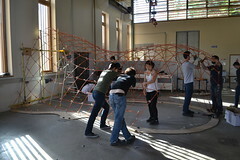 The shape is a channel surface meshed along its lines of curvature. 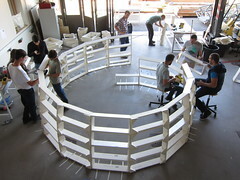 24 blocks forming a double curved arch have been assembled and various bracing systems have been tested. 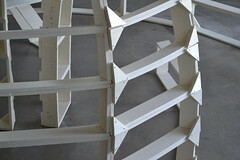 The vertices of every blocks are co-planar and co-cyclic which eases the definition of offsets and cladding. 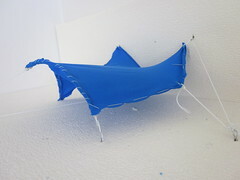 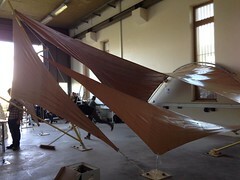 Veiled extension is a tensile structure that consists of three pieces of fabric connected to a mast. 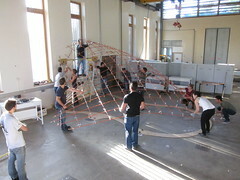 The covered area is 30m² with an average clear height of 3m. 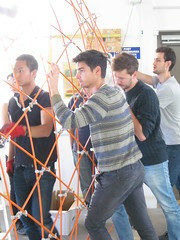 The mast is made of two composite pipes parallel to the each other, pinned at their base and connected at each end with rigid studs. 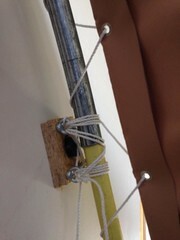 A system of two struts and cables is used to prevent buckling. 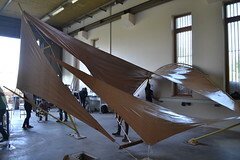 The mast is 4m high and makes an angle of 60° with the ground. 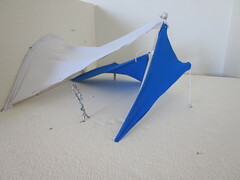 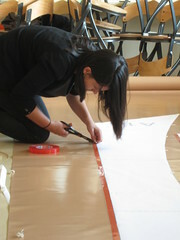 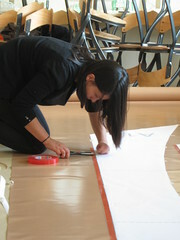 A steel and composite arched member is then fixed to the wall in four points, providing a fixed ridge for lacing the largest upper tension fabric. 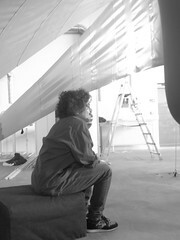 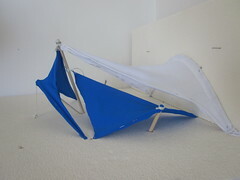 The two other fabrics are connected to the mast and oriented in different directions to create an enclosed space. 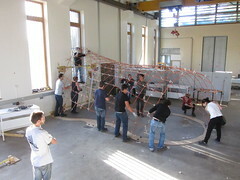 The first one oriented East-West is connected to the base of the arch and to a lower point on the mast. 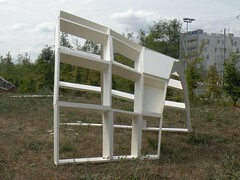 The second, oriented North-South plays a crucial role in the good behavior of the structure as it takes the tension of the entire structure to the foundation. 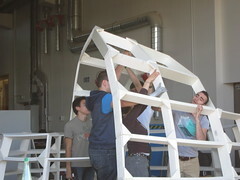 It is attached to two supports on the ground and to the mast. 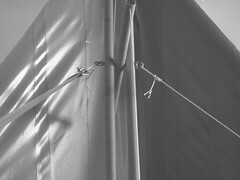 A cable is attached to this last fabric and fixed to the ground to counteract the tension induced in the mast by the two first sails. 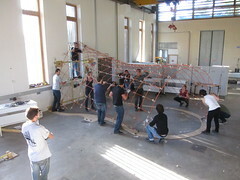 The first idea was to create an impression of infinity through a spiralling structure ending inside of itself. 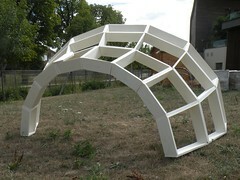 The concept was inspired from the picture of a snake that bites its own tale, existing in different mythologies under the name of Ouroboros or Jörmungand. 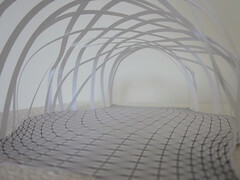 The geometry of the gridshell had to be based upon a generalised canal surface to ensure torsion free nodes. 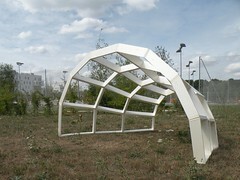 These surfaces are generated from a profile curve extruded along a guide curve. 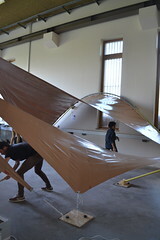 It allows various kinds of design, but most of those give a strong tunnel impression, which we wanted to avoid. 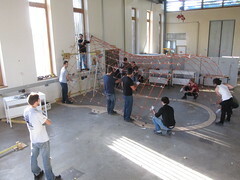 In order to do that, we combined the spiralling concept with the canal surface by decreasing the dimensions of the profile line gradually until it came back inside of itself. 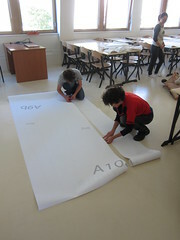 We erased then part of the arches to create a room for the table. 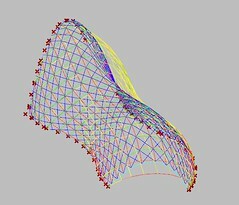 The profile curve is a semi-ellipse with the major axis aligned along the vertical direction. 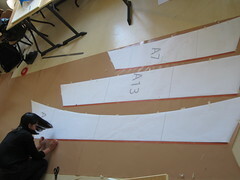 The guide curve has the form of a spiral. 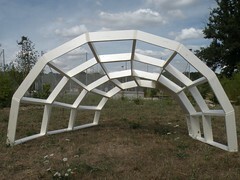 We only keep the external part of the arches complete, removing the internal part everywhere except on two places which gives stability to the structure against the weight of the cantilevered parts. 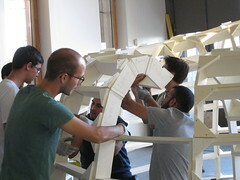 The whole structure is discretized in voussoirs made of four plates of polystyrene assembled with screws and tape for rigidity, and braded in the corners. 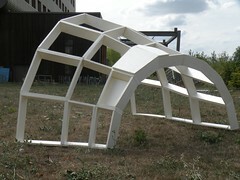 The general form of the structure results from the joining of two hemispheres connected together by a lower area. 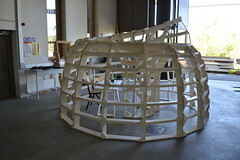 The first hemisphere, near the window houses the entrance, the second host the space for the table. 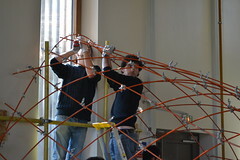 This form was meshed with the compass method to obtain the geometry of the structural grid that will then form the elastic gridshell. 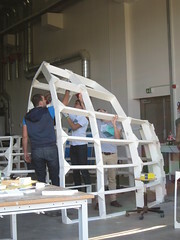 The gridshell itself is made of rods with a 10mm diameter made of composite material (epoxy Glass +). 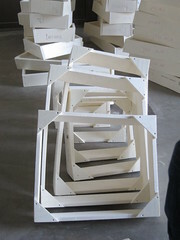 Continuity joints are realised by 50mm long steel tubes used as muff. 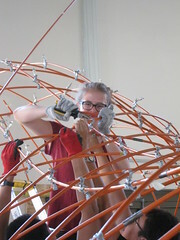 Connections between the two directions of the grids are then made with swivel plumbing connections. 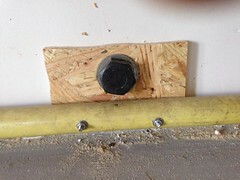 The ground supports are provided by brackets fixed on a OSB board connected to the rods by 1.5mm steel wire. 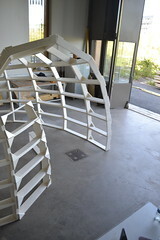 Around the window, the supports consist of a rod reinforced by a secondary composite structure. 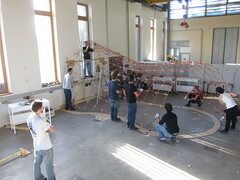 The height of the structure is variable to suit the needs of areas: 3.2 m near the window for light, 2.4m in the main space for privacy. 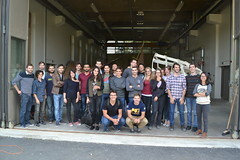 Many thanks to all the participants of the workshop, for their implication, their dynamism and enthousiasm, many thanks to: Gaëlle Albert, Mathieu Bailly, Coline Barillot, Ayoub Ben Khalifa, Ingrid Bertin, Joffrey Bluthe, Charlotte Borrits, Khalil Cadi, Benjamin Claudet, Allan Condesso Goncalves, Thibault Etcheverry, Hanadi Ettroudi, Camille Guérout, Pierre Hassold, Marcus Huebner, Renata Iwama, Rémi Journo, Fahd Khenessi, Clara Kindermans, François Latour, Camille Lauras, Ugo Lesprit, Florence Li, Anaïs Lovera, Romain Martin, Nicolas Meunier, Arnaud Michon, Jérémie Pelletier, Ricardo Pelliciotto, Rodrigo Pinho, Christiane Richter, Jean Souviron, Yuta Suzuki, Maureen Tricard, Marc Vanderweyen, Marine Bagnéris, Cyril Douthe, Lionel Du Peloux, Romain Mesnil.